The first day of school at the new Evangelical Lutheran School of Hope in Ramallah, August 2017. Ya’tik il-‘afye, the Arabic phrase for “good job,” was shared freely between students, staff and teachers as they basked in the sunlight their new building provided. 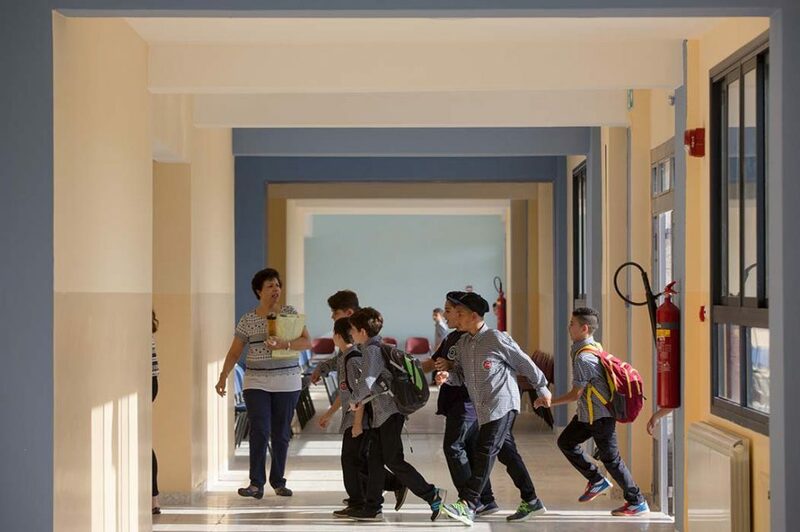 This is how the Evangelical Lutheran School of Hope in Ramallah opened its doors in August, welcoming students to a new, expansive building for a new school year. The school is one of four in the West Bank connected to the Evangelical Lutheran Church in Jordan and the Holy Land (ELCJHL), with a co-educational history extending back to 1851. Today the schools combined serve more than 2,100 students. The ELCA is connected to the schools through the Young Adults in Global Mission volunteers who teach English in the West Bank and Jerusalem and support ELCJHL educational programs. It also partners with the church to fund evangelism, communications, theological education, personnel and capacity building in the area. This new building—and the opportunities it will provide this school year and beyond—are a beacon of hope in an area rife with tension. On opening day, kindergartners through 12th-graders and their parents flooded into the double doors for the first time after much anticipation. Fellow students greeted each family with baskets of candy to start their day. “Tfadal!” (come in) they repeated as each family approached. The doors lead to a lobby that opens into an outdoor courtyard where morning announcements and daily devotions will happen, but today was filled with excitement as students buzzed about greeting friends they hadn’t seen since summer. A few of the curious try to sneak into their classrooms before the scheduled time, and are redirected by teachers standing by in the halls. “The new building gives the students freedom. Freedom to roam and learn in good spirits,” said third-grade teacher Ida Abu Kishek, who also has a daughter in the school. She said the teachers’ good outlook, a new building and a new approach to education will improve the students’ experience greatly. It takes all three of these for a good education, she added. After announcements and a morning filled with fun, students were dismissed by grade to enter their classrooms. The building is sectioned according to grade. The Tawjihi students—11th- and 12th-graders—are situated near the entrance of the building and staff offices. They are called Tawjihi because of an exit exam given to graduating seniors that also serves as an entrance exam to universities and colleges. The Tawjihi is recognized by the Palestinian Authority Ministry of Education as a marker for readiness to higher education. The main floor of the school is divided into three sections. The first is for first- through sixth-grade classrooms, the second is for seventh- through 10th-grade classrooms, and then the kindergarten classes. Also on the ground floor are science and computer labs and a conference room. The upper level houses a library and the arts and music. The broad yellow halls, lined in wide windows, are the first of a two-part phase of the original architectural plan. The complete phase one, where students began the 2017-18 school year, includes three science labs, technology-equipped classrooms, and garden coves throughout the building that can be viewed as the students pass by in the halls. The coves will also serve as space for agricultural education projects like gardening or other horticultural experiments. “This new building will motivate them to come to school, and mostly, I hope that it will motivate them to take care of things, to keep it clean, to be careful with everything, because everything is so beautiful,” said Mirjam Lucas, head teacher of the German Education Department at Hope. Hope is traditionally a place where Christian and Muslim parents alike place their hope in a stellar education from the private Lutheran school that would most likely ensure admission to local and international colleges and universities for their children. A family’s option outside of a private institution is one of the public schools, which face enormous overcrowding. “There is more space and it is more like a school. It will reflect on their education,” said Yazet Abu Hazarahn, the father of four Hope students—an eighth-, seventh- and fourth-grader and a kindergartner. Read the next installment of the series here at livinglutheran.org on Thursday, October 12. Gray is an ELCA deacon and missionary who serves as communications coordinator with the Evangelical Lutheran Church in Jordan and the Holy Land.